Local currency government bond yields in emerging East Asia trended downward between 28 December 2018 and 15 February 2019, according to the latest Asia Bond Monitor. Bond yields edged lower partly driven by expectations that the United States Federal Reserve will slow its pace of monetary tightening in 2019. The report also noted the size of emerging East Asia's local currency bond market surpassed USD13 trillion at the end of December. * Guaranteed by the Credit Guarantee and Investment Facility. The People's Republic of China's gross domestic product (GDP) grew 6.4% year-on-year (y-o-y) in the first quarter of 2019, the same rate of growth as in the fourth of 2018. At its 18 April Monetary Policy Board meeting, the Bank of Korea decided to hold steady the base rate at 1.75%. The Bank of Korea also revised downward its estimates for 2019 GDP growth from a projection made in January of 2.6% to the mid-2% level. Indonesia recorded a trade surplus of USD0.5 billion in March, up from USD0.3 billion in February. Singapore's non-oil domestic exports fell 11.7% y-o-y in March after rising 4.8% y-o-y in February. Consumer price inflation in Japan rose to 0.5% y-o-y in March from 0.2% y-o-y in February. Personal remittances from overseas Filipinos rose 1.2% y-o-y to reach USD2.6 billion in February. The Philippines posted an overall balance of payments surplus of USD627 million in March, expanding from USD467 million in February and reversing the USD266 million deficit recorded in March 2018. * Follow the steps and build your options. The result will take you to Portal landing page. For more Bond Market indicators, visit Data Portal page. Notes: 1. CN=People's Republic of China; HK=Hong Kong,China; ID=Indonesia; KR=Republic of Korea; MY=Malaysia; PH=Philippines; SG=Singapore; TH=Thailand; VN=Viet Nam. 2. Data as of end-September 2018. Notes: 1. CN=People's Republic of China; ID=Indonesia; KR=Republic of Korea; MY=Malaysia; TH=Thailand. For more Market Watch indicators, visit Market Watch page. Notes: CN=People's Republic of China; HK=Hong Kong, China; KR=Republic of Korea; SG=Singapore; US=United States of America. Notes: ID=Indonesia; MY=Malaysia; PH=Philippines; US=United States of America; VN=Viet Nam. Notes: A positive (negative) value for the foreign exchange rate indicates the appreciation (depreciation) of the local currency against the United States dollar. 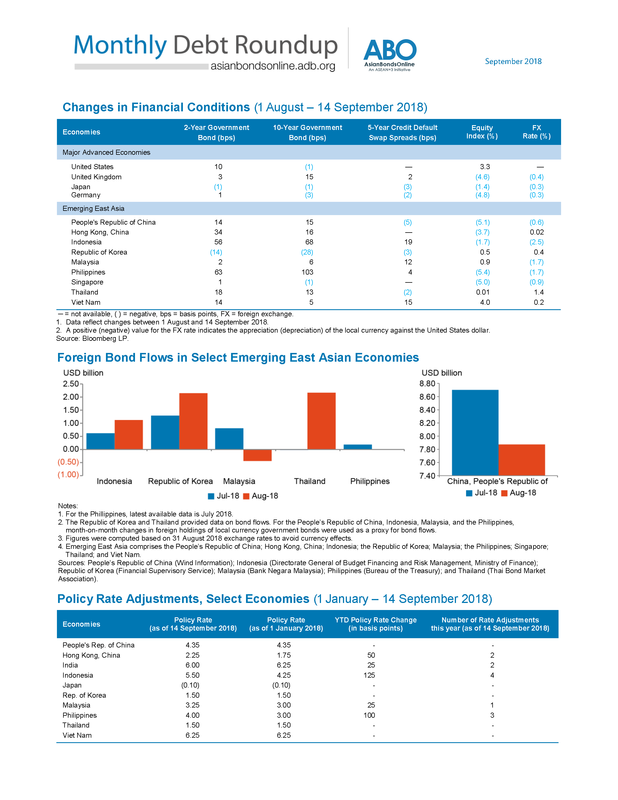 The Asia Bond Monitor (ABM) is AsianBondOnline's quarterly publication released every March, June, September, and November. The report reviews recent developments in East Asian local currency bond markets along with the outlook, risks, and policy options. The ABM covers the 10 Association of Southeast Asian Nations member countries and the People's Republic of China; Hong Kong, China; and the Republic of Korea. The Weekly Debt Highlights Report provides a summary of the relevant key macroeconomic data and monetary policy updates released in the previous week in the various economies covered by ABO. The report also includes select government and corporate debt issuances, credit rating updates, and other relevant regulatory developments. The report is published every Monday. The ABO Monthly Debt Roundup provides a snapshot on changes in financial prices such as foreign exchange, yields, equity as well as recent monetary policy rate movements in the region. In addition, the ABO Monthly Debt Roundup provides data on foreign investor bond flows of local currency government bonds for the PRC, Indonesia, Malaysia, the Philippines and Thailand. The ASEAN+3 Bond Market Guide is a series published by the ASEAN+3 Bond Market Forum in collaboration with ADB as its secretariat. Each country-specific guide provides information on the investment climate, rules, laws, opportunities, and characteristics of the local bond market. The guides are produced in close consultation with local policymakers and market players. Source: Philippine Dealing & Exchange Corp. The AsianBondsOnline web portal is an ASEAN+3 Initiative supported by the Asian Development Bank and funded by the Ministry of Finance Japan, through the Investment Climate Facilitation Fund. Read more▸. AsianBondsOnline 2019 © Asian Development Bank. All Rights Reserved. Reproduction in whole or in part without permission is prohibited.